Channel your inner Tyrion Lannister with this fantastic Game of Thrones tankard! 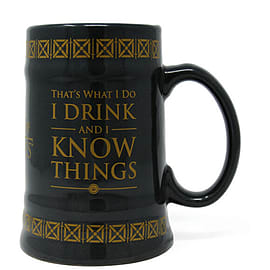 Featuring his famous quip “I drink and I know things” in large gold print, there is no better way to inform those around you about your vast knowledge and desire to drink all manner of beverages. 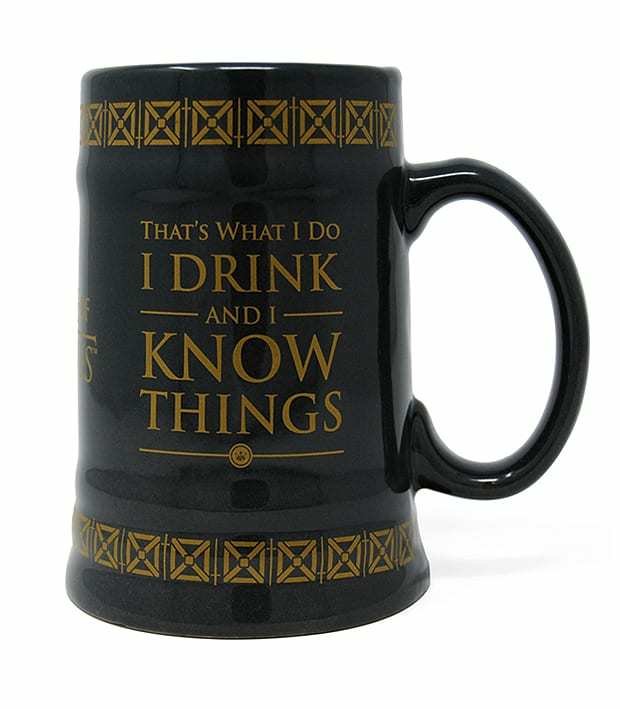 This great piece of officially licensed Game of Thrones merch is black, with gold print featuring Tyrions “I drink and I know things” quote, as well as the Game of Thrones logo on the reverse side. The rim is decorated with a gold box pattern – split by tiny gold swords. Like Tyrions vibrant personality, this GOT tankard is huge, holding 568ml of your favourite beverage – maybe an Arbor Red or some Tyroshi Pear Brandy? Even a large cup of tea so you don’t have to get up and make many whilst watching your favourite GOT episodes! Whatever your chosen drink, this tankard is perfect to hold it so don’t miss out! Shop the Game of Thrones I drink and I know things tankard today, at GAME.